For the second quarter of 2019, I’m nominating a larger project (but still only one). 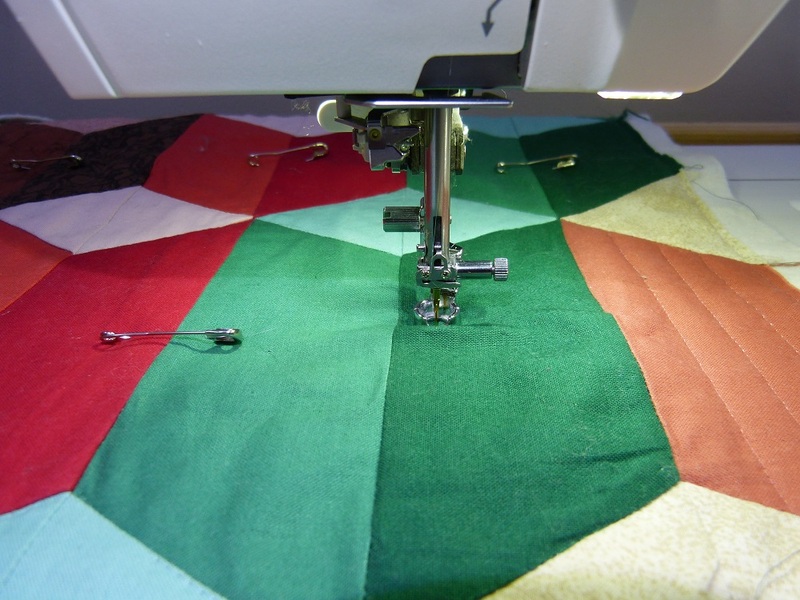 As usual, I’m linking through Sandra of Sew Of Course in Ireland. This project is only eighteen months old so it barely qualifies as a UFO in my book, but I’m going to finish it off anyway. In November 2016, Bonnie Hunter launched her annual mystery quilt, En Provence. The palette for this project was based on the lavendar farms in southern France — lavendar, purple, magenta, green and yellow. I love the palette and was very tempted to do the mystery but decided to wait until I saw the completed top. I’m glad I did, as I didn’t like the balance of colours in Bonnie’s quilt — too heavy on the dark purple and magenta for my taste. As the year progressed, I saw other versions in different colourways and liked them better than the original. 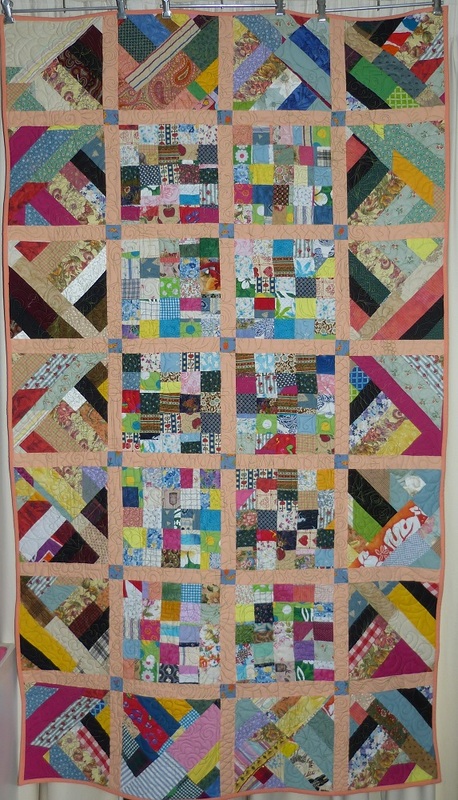 This top by Melinda Shackelford was in brown and green, and it was the one that convinced me I could make this quilt. 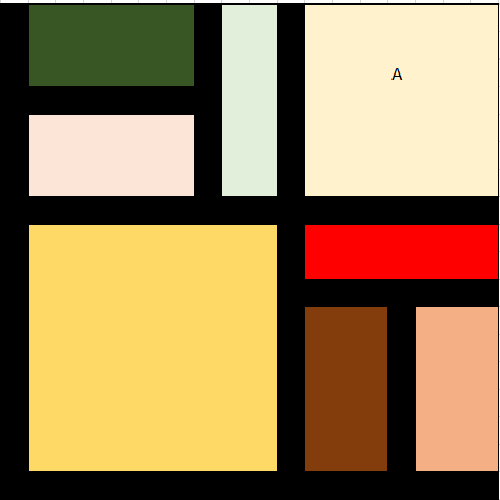 I decided to do a version in caramel, brown, green and burgundy (hence the name change). Several times during the year I made notes and calculated fabric requirements. 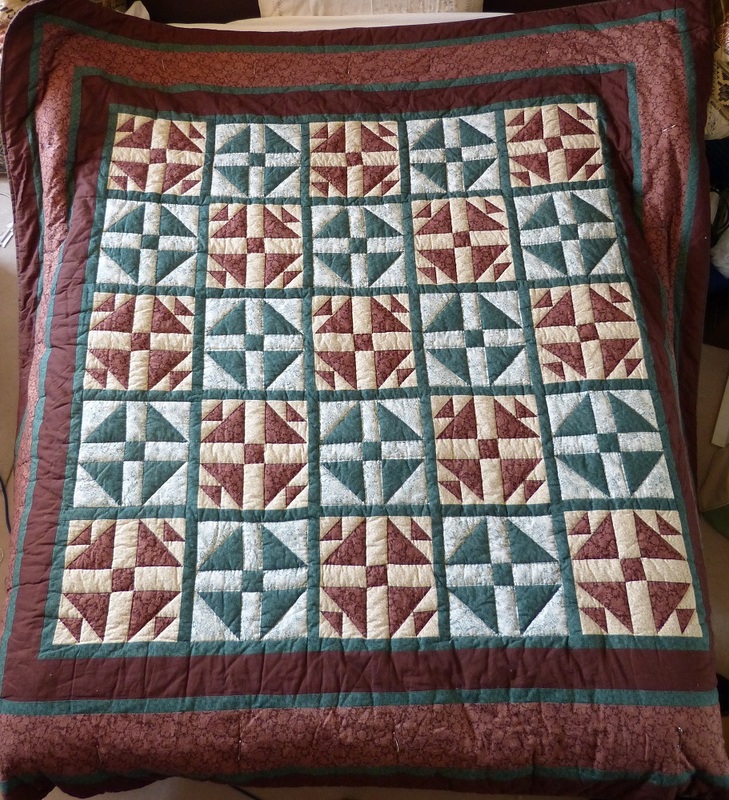 I changed the quilt’s construction, too — Bonnie made it up as a 15″ block with 3″ pieced sashing, but I loathe pieced sashing and I saw that it could be made as three different 9″ blocks instead. 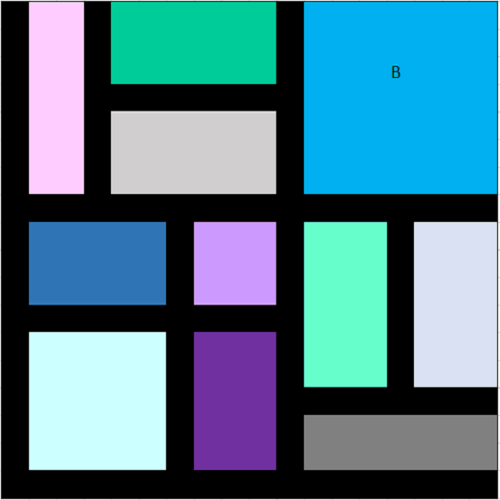 I replaced the tall triangle unit with a quarter square triangle in Block B (which reduced the curve along the brown diagonals), and I used print squares instead of neutral four-patches. I started cutting and sewing units in early October 2017. I used fabrics from my stash, ranging from greens and caramels that had been bought in 2017 all the way back to a crimson poplin which was so old it was 36″ wide (early 90s) and a dark brown print that had been used in Autum Mood (1988). 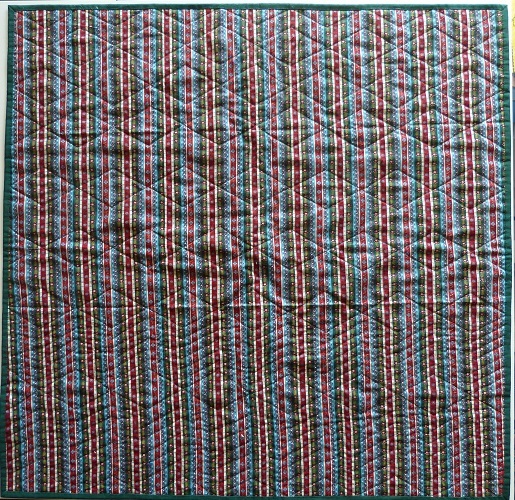 I was in no hurry, and I gave myself permission to make mistakes because I wanted this quilt to be about enjoying the process rather than making a perfect project — I had spent too much time with deadlines during the year and was feeling the grind. 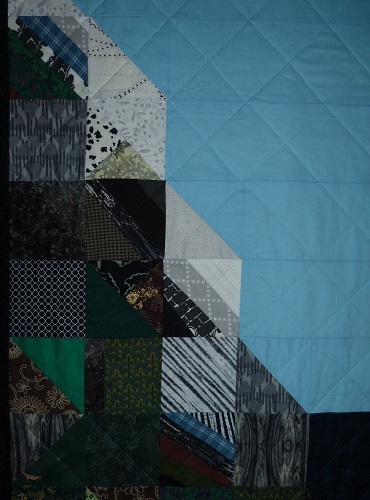 The method I used for the quarter-square triangles required pressing to one side rather than open, and consequently I decided to press to one side for the whole quilt. Unfortunately this made for some very bulky areas in the seams, and served to reinforce my preference for open seams. As my AHQ commitments died down I spent more and more time on it, and towards the end I was working several hours a day. I finished setting the blocks together on 30 November. 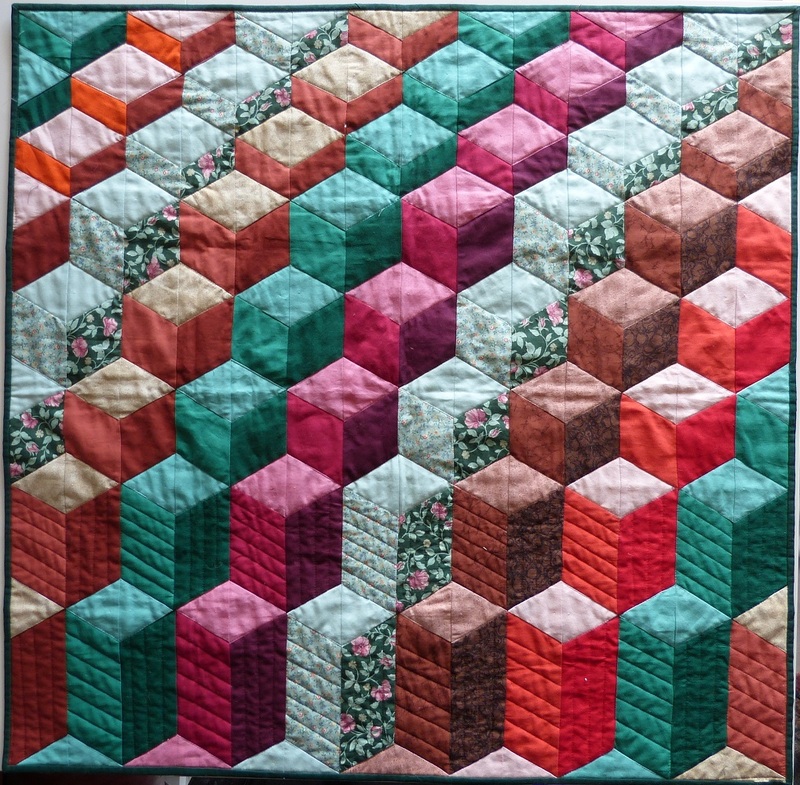 I knew that it needed a border or two, since the size (81″ square) was a little small for a queen bed, but I couldn’t decide on what fabrics to use, so it languished in a box for eighteen months. For my FAL goal, I’m going to add two borders to the top, then quilt it. 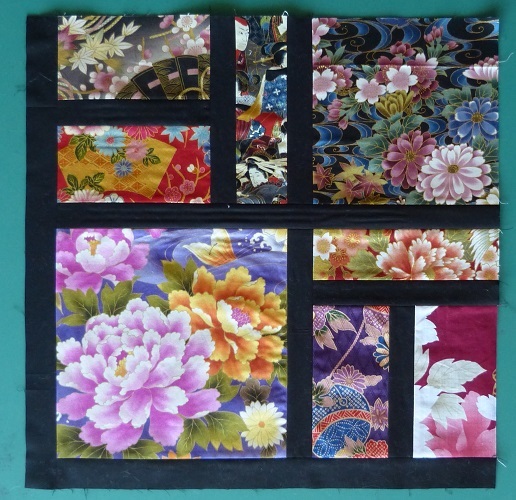 I’ve chosen the fabric for the first border (shown in the photo) but I’m still not sure about the second. I had a little spare time this afternoon after finishing an Aussie Heroes quilt and I had black thread in the machine from the quilt’s binding, so I decided to make one of the Oriental Stained Glass blocks I had cut out. 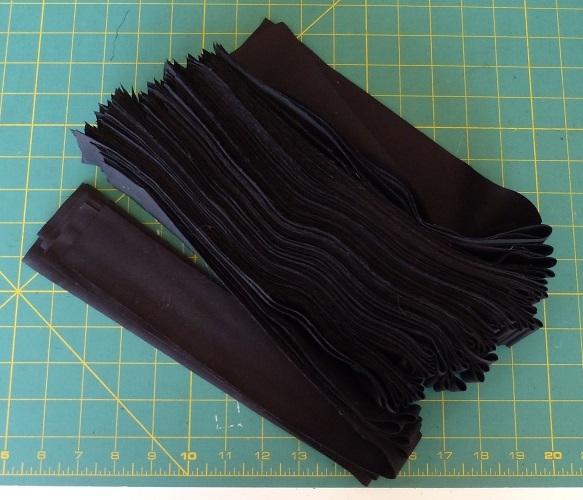 In the process, I discovered that I had somehow managed to add twice the seam allowance to the black sashing strips — they were supposed to be 1″ finished / 1.5″ cut, and that’s what it says on the spreadsheet and at the top of my notes page. 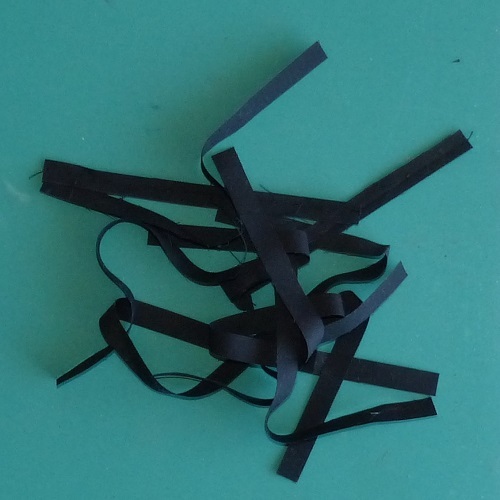 However, further down, when I wrote the cutting instructions, I had somehow forgotten that and wrote that the strips were to be cut at 2″, finishing at 1.5″. Yikes. See all those 83 strips? Every single one of them is half an inch too wide. 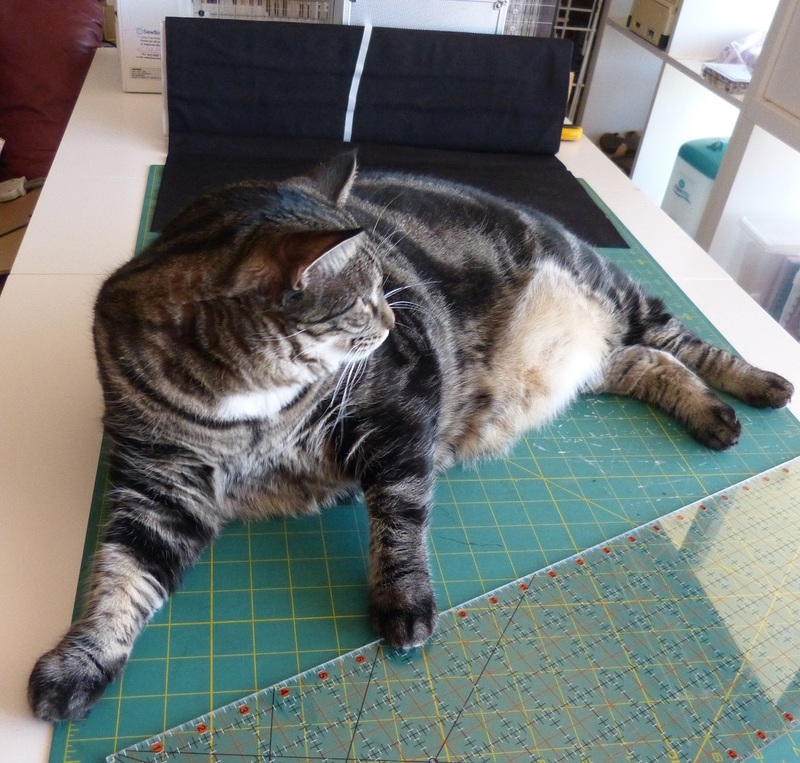 I wasted more than a whole metre of fabric because I didn’t check my own work. So stupid. Still, the lengths are all correct and all of the oriental fabrics are cut the right size, so it’s not a complete disaster, just intensely frustrating. 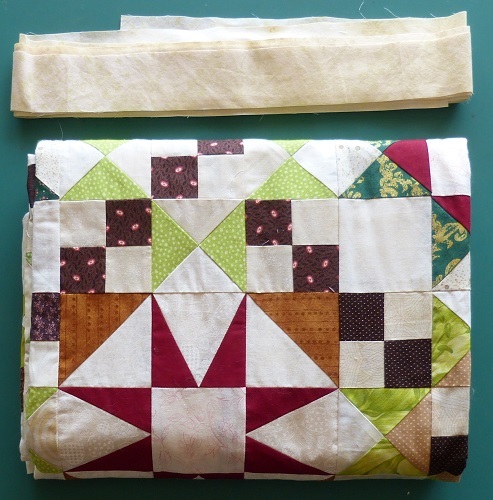 There’s nothing for it but to trim all the sashes if I want to make this quilt — I decided to do it block by block as I sew them together rather than trying to do a lot at once. Even with the additional trimming (and a couple of unsewing sessions when I sewed the sashing to the wrong edge) it didn’t take long to make a block so I’ll try and do one a week until the top’s done, and then it may feature in a future Finish-A-Long post. As usual, my monthly goals were divided into Aussie Heroes, Personal and the 2019 Finish-A-Long. 1. AHQ: make two quilts: Done. One was posted this morning, the other is in the wash and will be posted tomorrow. Pictures will be on the AHQ blog sometime. 2. Personal: none set for last month. 3. FAL: Bind the tumbling blocks mini: Almost done. 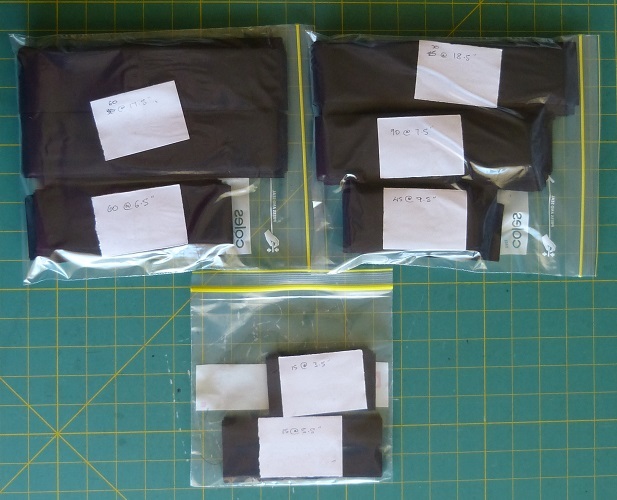 I’ll post pictures and details later this week during the Q1 FAL round-up. I finally got around to cutting the black sashing for my Oriental Stained Glass quilt (I cut the oriental fabrics in January). Vanima “helped”. 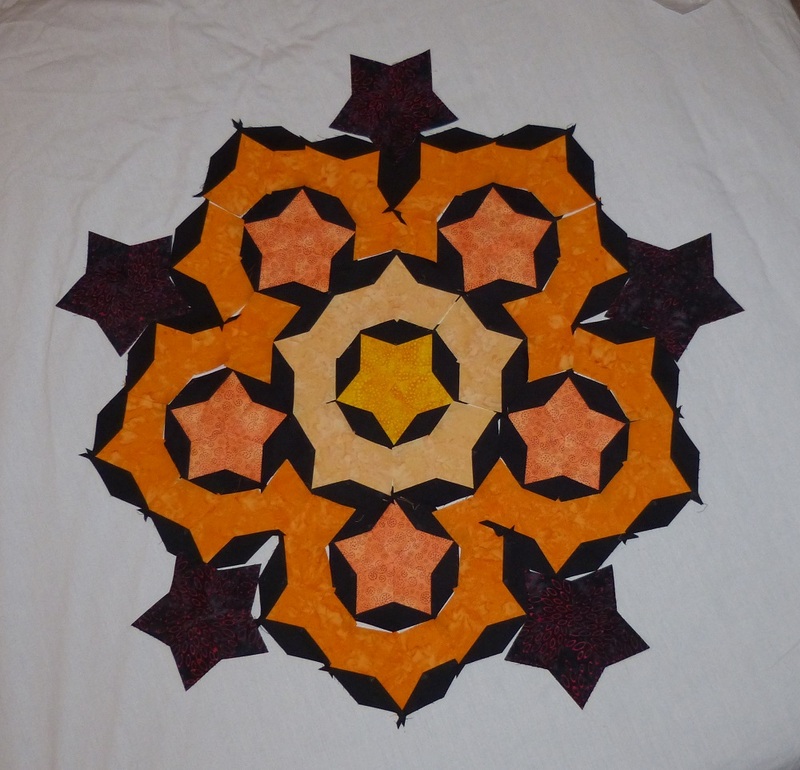 I also finished tier 3 of the Penrose tile quilt I’m doing — I posted about that here. 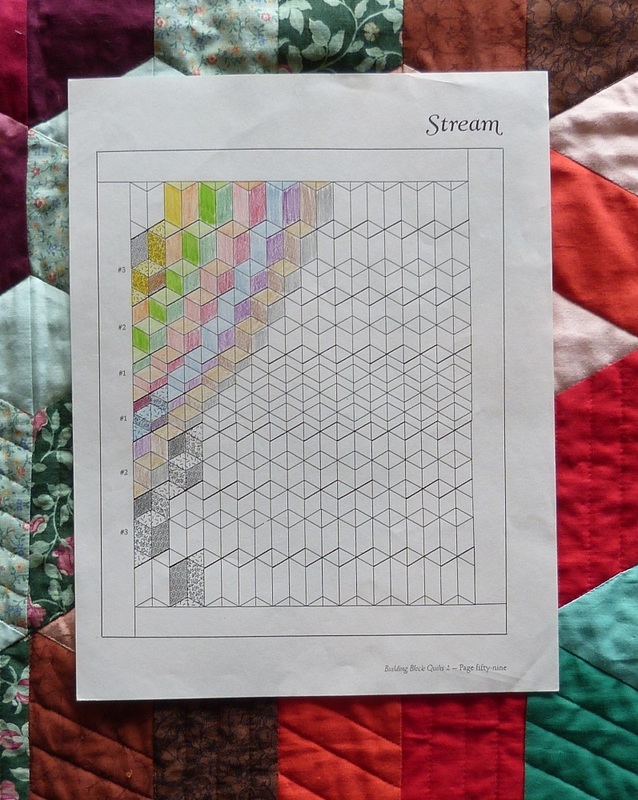 I’ve started work on the next section but I doubt I’ll get very far before the cold weather sets in and I can start quilting Penrose 1 (the quilt in the header). 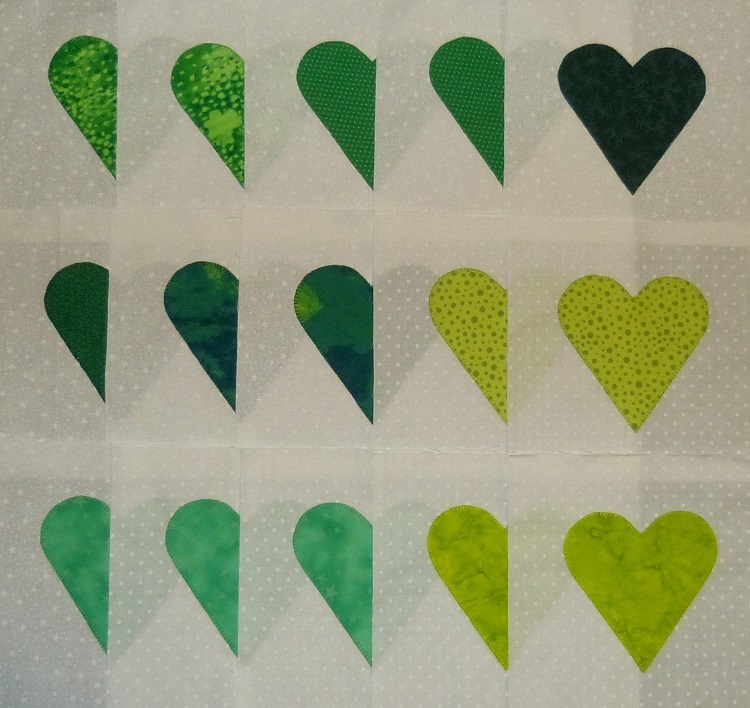 Finally, I made 15 appliqué heart blocks and sent them off to New Zealand (details here). 1. 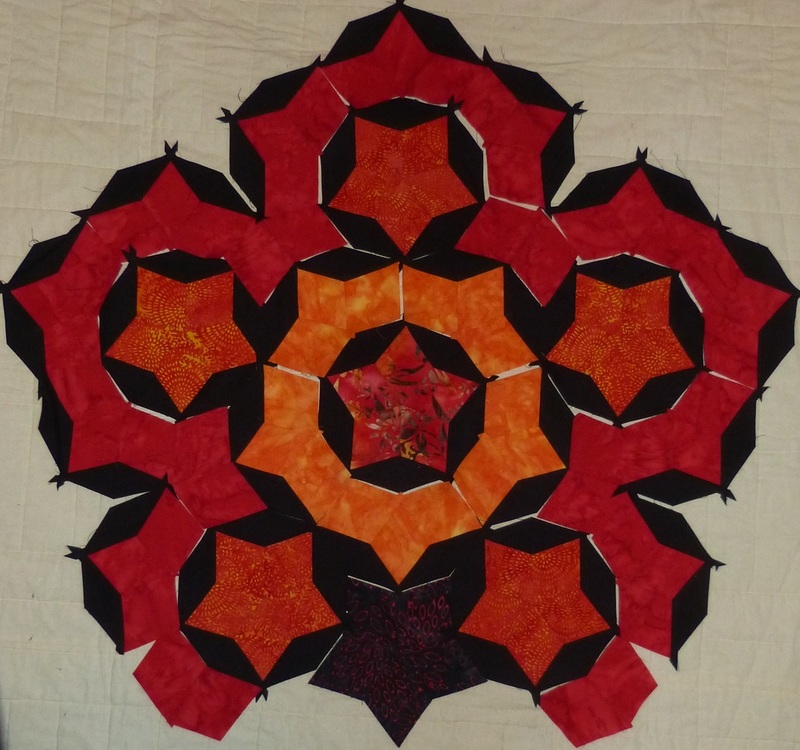 AHQ: One quilt and bag for a recipient in the Middle East. I also want to make some laundry bags for Townsville — many ADF members lost their quilts and laundry bags along with everything else during the monsoon floods in January — we can’t replace everything but we are doing our best to get everyone a new laundry bag. 2. Personal: the final two (out of twenty) Hawaiian appliqué blocks. 3. FAL: to be determined (I think I know which project I’ll choose, but I might change my mind). 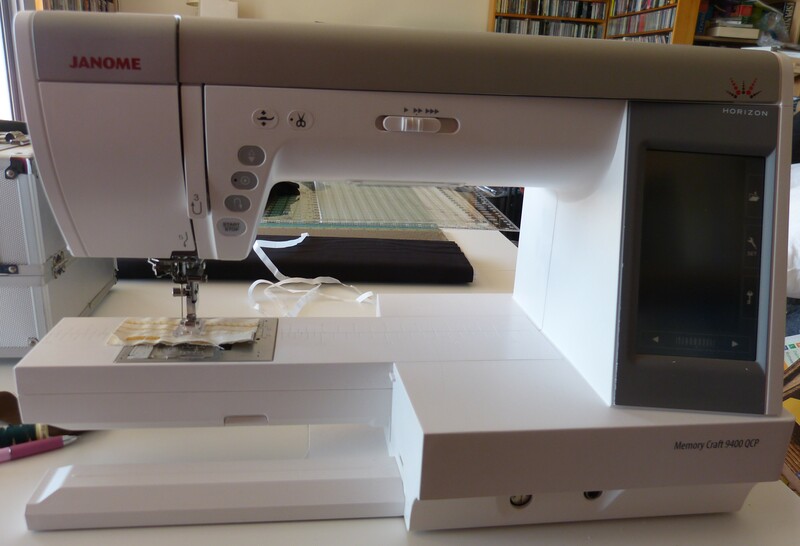 I got my machine back on Tuesday afternoon (having taken it in on Monday morning) — great service. The bobbin timing had been knocked out, which isn’t surprising, and they had to replace the bobbin holder. 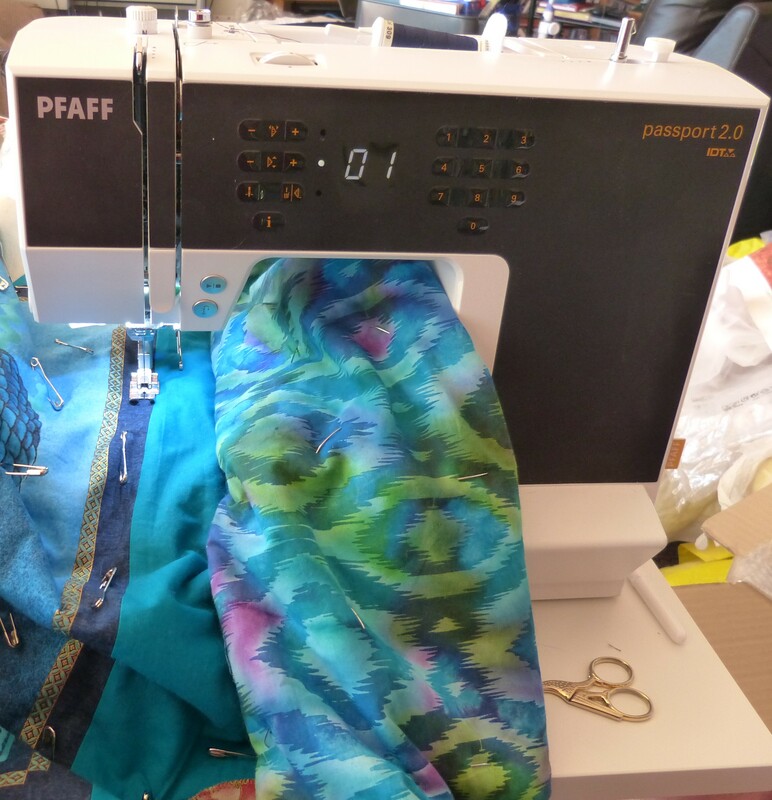 I found that while the Pfaff Passport 2.0 is great for piecing and appliqué (it did all the hearts at the weekend) it’s not so good at quilting. Even with the Integrated Dual Feed in place I was getting a lot of drag on the top layer of this quilt, so unpicking that is this evening’s task. I’m not fussed that it can’t do quilting, actually — it’s a small machine and it’s perfect for taking to sewing days and retreats so I’m still very happy that I bought it. 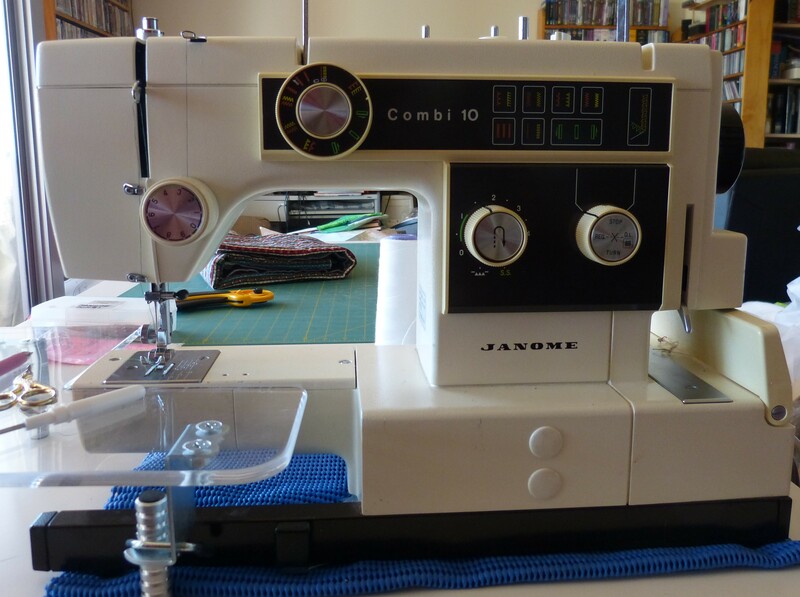 Besides, I have several other machines I can turn to for quilting if the 9400 is out of commission, like the Janome Combi 10 which I used for the binding on the other quilt. 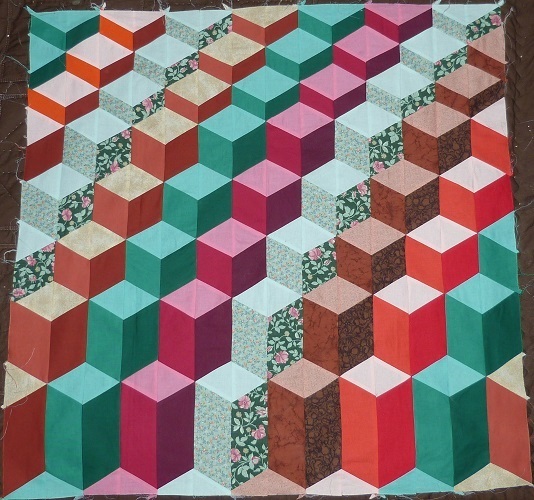 Helen Thomas at Angels in Gumboots is coordinating a drive for heart blocks to make quilts for the families affected by the shooting ten days ago. I grabbed a bunch of green fabrics and made up 15 appliqué blocks over the weekend. They’ll go into the post tomorrow or Wednesday. If you are interested in contributing, the info is here. 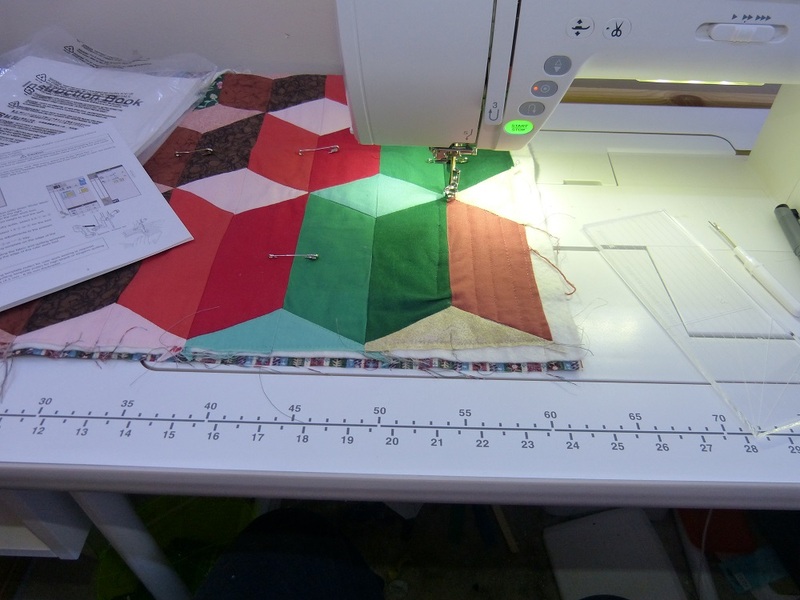 In other news, my Janome 9400 pitched a fit last night while I was quilting a border and has gone in for repairs. I don’t know exactly how it happened but the bobbin holder was pulled right out of its position and had a gouge out of one side (the needle, strangely enough, remained intact). I was doing a serpentine stitch at the time and none of my other Janomes has the same stitch which is annoying. 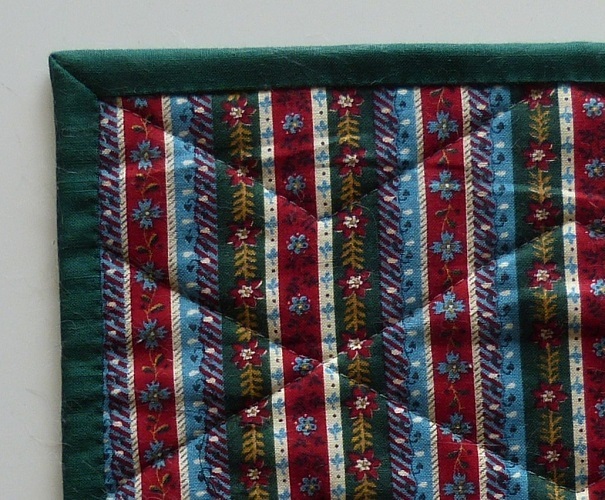 The Pfaff has one that is similar but not identical, so I’ll use that and hope that the recipient doesn’t mind that one border isn’t quite the same.